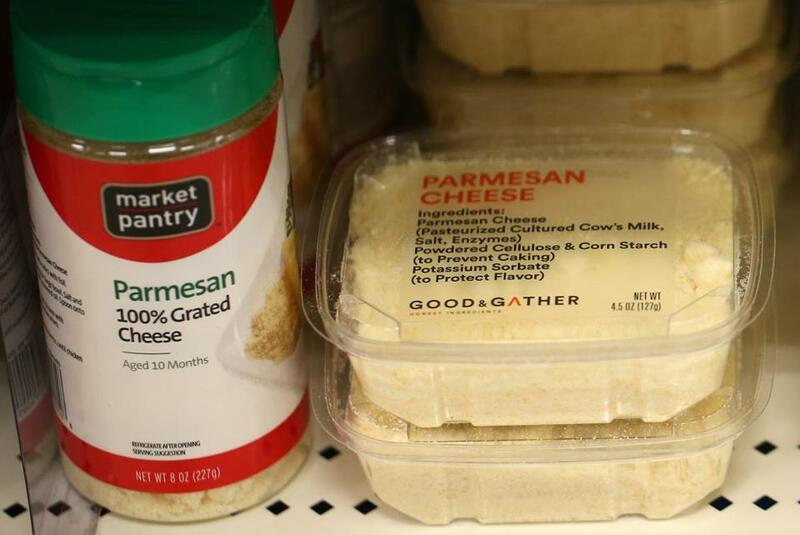 Prototype packages and signs giving consumers more detailed information on food choices were tested at the South Bay Target store in Dorchester. The Food + Future coLAB — a collaboration of Target, the Cambridge design firm Ideo, and the Massachusetts Institute of Technology Media Lab — is developing new ideas on how markets can interact with their customers. The raspberries on the shelves at the South Bay Target recently were uniform in appearance — plump and pink and sealed in tidy plastic boxes. Perched in the middle, however, a simple red-and-white sign pointed out a difference. 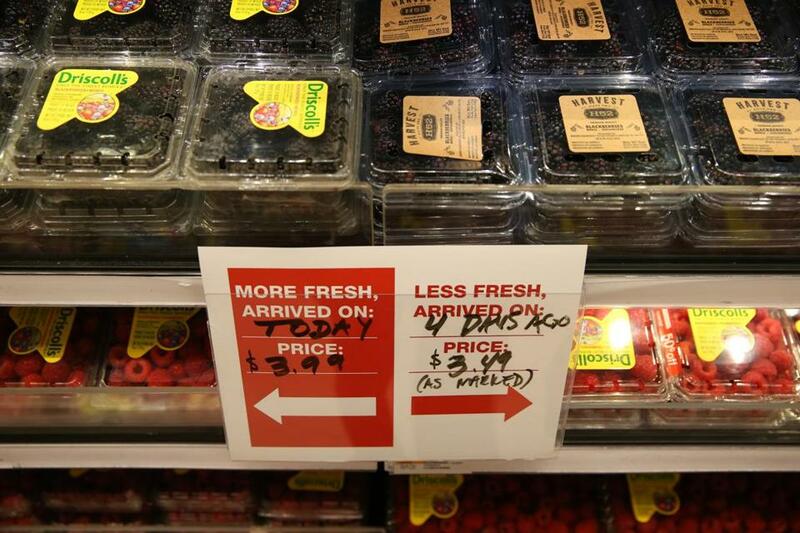 On the left were pints of berries that had arrived in the Dorchester store that same day, priced at $3.99. To the right, fruit that had been on the shelf for four days, offered at a 50-cent discount. It was a simple experiment, aimed at testing whether consumers would trade freshness for price. But this trial run was just a small part of a larger movement that is reshaping one of our most common and consistent shopping experiences: the supermarket. 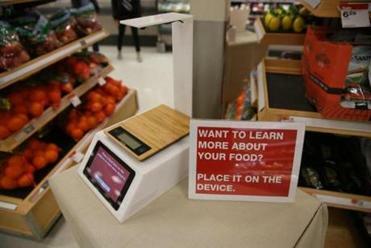 An experimental scanner for checking food ingredients was deployed at the South Bay Target. Innovators, entrepreneurs, and establishment food retailers are beginning to imagine the supermarket of the future as a space that combines technology, personalization, and local color to satisfy consumers’ ever-growing hunger for health and convenience. Among the visions already being planned and piloted: smaller stores heavy on prepared-food options, new packaging that makes it easy to understand a product’s ingredients, in-store scanners that instantly assess an apple’s nutrition, and even delivery services that let busy consumers skip the store altogether. One of the principal areas of research and experimentation is how shoppers interact with individual foods. The Food + Future coLAB — a joint effort by Target, the Cambridge design firm Ideo, and the Massachusetts Institute of Technology Media Lab — is developing several concepts aimed at revolutionizing the supermarket shelf. “It is our belief that everything has to start with transparency,” said Greg Shewmaker, Target’s entrepreneur-in-residence. The freshness-based pricing that was tested in Dorchester is just one of these efforts. Nearby, the coLAB also ran a trial to determine whether consumers would use an in-store scanner to learn more about a product’s nutrition, origins, environmental footprint, and organic or GMO status. The vision is to eventually use spectroscopy scanners — which use light waves to determine the properties of an object — to let shoppers learn more details about the specific items they plan to buy. Eventually, consumers could even get a report at checkout that quantifies money spent, calories purchased, and total nutritional content of a grocery order, Shewmaker said. The coLAB team is also testing a concept it calls Good and Gather, a new packaging design that is completely — and literally — transparent. Ingredients are listed on the front of containers in large type, rather than being crammed into a small space on the back, and shoppers can see the appearance and quantity of the food inside. The goal is openness and honesty, not necessarily to promote the foods as healthier than other options. The idea was tested in stores on packages of corn chips, peanut butter, pasta sauce, oatmeal, trail mix, and even orange-dusted cheese ball snacks. 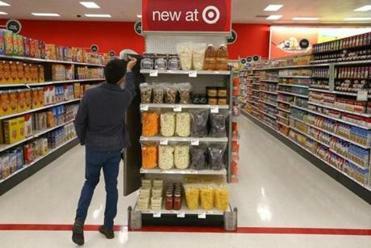 Customer feedback was overwhelmingly positive, said Target spokeswoman Jenna Reck. Smartphones will also play a role in our grocery-shopping future. Ken Morris, principal at consulting firm Boston Retail Partners, predicts more stores will use proprietary apps or other phone-based data to make “guided” shopping experiences the norm. Consumers will be offered coupons for items they browsed online earlier in the day, for example, or notified when they wander close to an item on their shopping list. Seijen Takamura, a Target employee, checked specially packaged food items on a new-product display shelf in the store. Taking the phone-centered experience a step further, the Food + Future coLAB has also begun thinking about how to use augmented reality — the layering of images or information over images of the real world — to improve grocery shopping. Imagine looking through your phone at the produce section and seeing only the items on your list, said Matt Weiss, managing director at Ideo. Or having items containing individual allergens blacked out. “It’s one of the most compelling visions of augmented reality I’ve seen,” he said. Brick-and-mortar stores themselves may also be in for an overhaul in years to come. Last fall, Stop & Shop parent company Ahold USA opened its first Bfresh urban grocery store in Allston; two more are slated to open in Brighton and Somerville later this year. On May 25, in Los Angeles, Whole Foods plans to open the first of its new price-conscious 365 stores. Both new chains aim to better serve specific populations while operating out of much smaller spaces than conventional grocery stores. This format is suited to urban dwellers who increasingly want to mix restaurant dining with meal delivery services like Blue Apron and traditional home cooking, said Rachel Greenberger, director of Babson College’s Food Sol entrepreneurship program. “Grocery stores are going to be more focused on who they’re serving,” she said. At each location, Whole Foods’ 365 stores are partnering with local food businesses — vegetarian fast food, fresh juice bars — to give shoppers a combination of standard offerings and locally tailored foods. Bfresh stores, which will each have about 10,000 square feet, will feature extensive made-from-scratch prepared food and the compact size will make it easier for shoppers to get in and out quickly. “We designed it so the urban shopper feels it’s a part of the daily rhythm of the neighborhood,” said Suzi Robinson, spokeswoman for Fresh Formats, the company operating the Bfresh stores. Even as retailers rethink store designs, however, some industry-watchers predict that the supermarket of the future will be one that shoppers never even enter, as services that allow consumers to buy online and have their purchases delivered continue to grow. The Food and Futures Project has been testing prototype packaging in the South Bay Target store in Dorchester. Sarah Shemkus can be reached at seshemkus@gmail.com.